First, he moved to a new daycare center: University Child Care Services. It was a difficult decision, because he was very comfortable at the Children's Discovery Center and we liked the teachers there. But he had been on the waiting list at UCCS since before he was born and when an opening came up, we felt we had to give it a chance. The UCCS program is on campus and supports research by the College of Human Environmental Sciences. 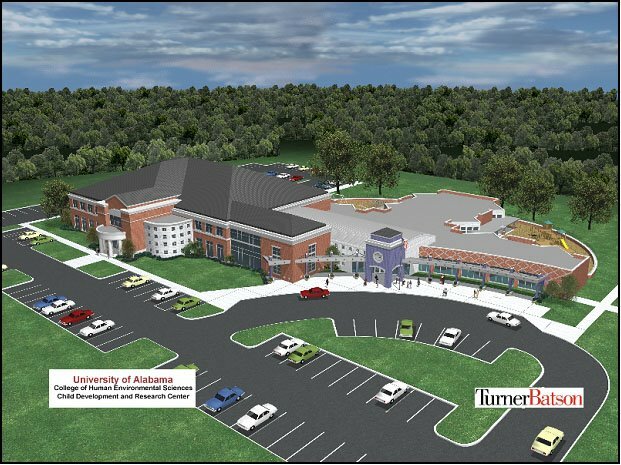 It's in a brand new facility, the Child Development Research Center. 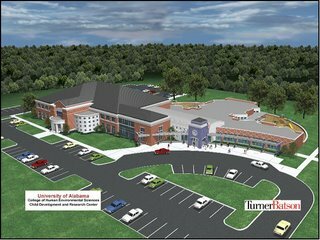 The UCCS is on the right side of this architect's drawing. It has all manner of cool playgrounds and other facilities. 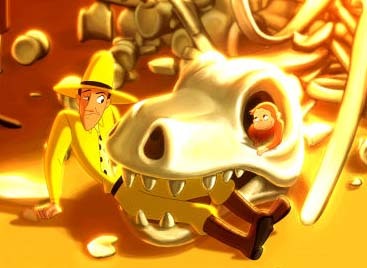 Ian's teacher is Ms. Caris, who is assisted by Mr. Mike. Since this is a teaching institution, there are also several undergraduate/graduate students who work with the children, too. So far, Ian loves it there. He can't wait to arrive in the morning and he has to be coaxed to leave in the afternoon. 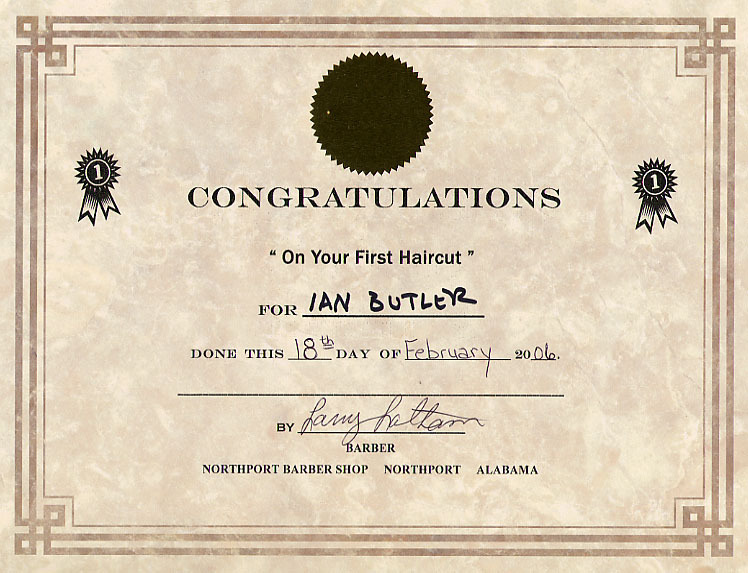 The second major event in February was Ian's first professional haircut. Marysia had trimmed his hair before, but he'd never had a barber lay hands on him. 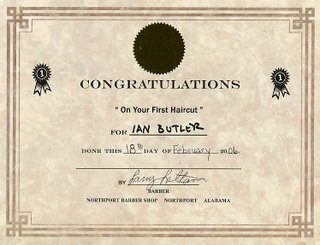 On 18 February, we took him to the Northport Barber Shop, which has been around for decades, and barber Larry Latham very patiently guided Ian through his first hair cut. (Note Ian's dad's expression reflected in the mirror.) 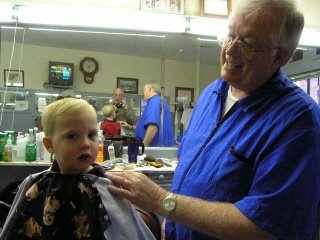 Larry was very good with Ian--showing him the clippers and explaining everything before he did it. And Ian was so mature! Didn't cry at all and hardly even squirmed in his booster seat. 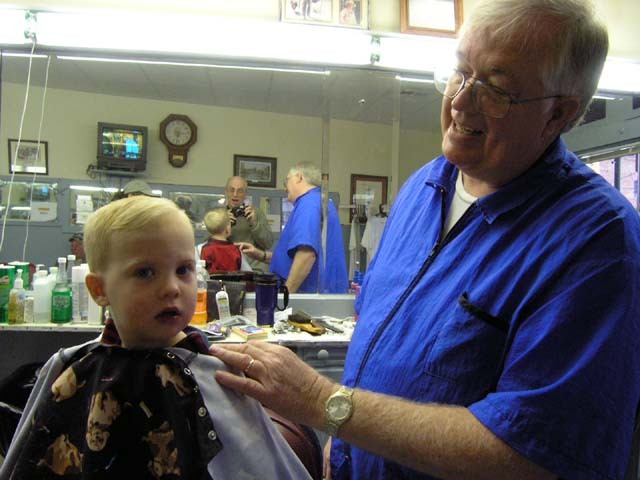 Maybe he was so calm because we've often walked past the barber shop and checked it out in the past. It's on our regular, Saturday-morning-walk route. But that's not all that happened in February. No sir! This was also the month that Ian went to his first movie in a movie theater. As we drove there, I told Ian it would be a big "TV screen" in a dark room. We arrived a little late and had to take seats in the last row of the theater. Ian sat on the arm of the chair so that he could see better and he was instantly transfixed. Of course, he did take his eyes off the screen long enough to eat popcorn (he is, after all, his father's son and his grandfather's grandson). After about an hour, he told me, "No want TV." I couldn't tell if he was scared or tired or what, but I figured that an hour was pretty good for a 2.5 year old. As we climbed down the steps of the theater, he was still fascinated with the big screen; but when I asked him if we should stay, he said no. So there you have it! A month (and a short one at that) of changes and firsts. Febrary 2006, we won't soon forget you! I know I'm biased, but, well, it is just too freakin' sweet.